The Toronto Maple Leafs unveiled the team's new home and road sweaters Monday, in front of more than 100 season seat holders, media, and corporate partners. The unveiling occurred as the Original Six hockey club enlisted the help of former team captains George Armstrong, Wendel Clark and Darryl Sittler to bestow the captaincy honours to Leafs defenceman Dion Phaneuf. The special announcement was the inaugural event at the new Real Sports Bar & Grill, located at Maple Leaf Square, which is located adjacent to Air Canada Centre. The Maple Leafs will debut the uniform beginning with the first preseason game September 21 in Toronto against the Ottawa Senators. The team’s nostalgic white ‘Third Sweater’ that debuted in 1998-99 will stay the same in 2010-11. This is the first modification to the Toronto Maple Leafs uniform since the beginning of the 2007-2008 season and fans will recognize the new changes based on past uniform lineage. 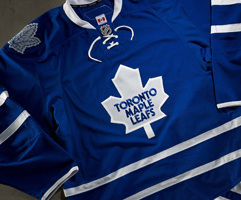 The two stripes on the arm and the 11-point Toronto Maple Leafs’ front crest, implemented at the start of the 1970-71 season, remains unchanged on the sweater. The team has brought back the two horizontal stripes around the waist which have been absent for the past three seasons. The ‘classic style’ veined Leaf logo (with no interior lettering) will return on the sweater as a shoulder patch as it did from 1992 to 2000. In addition, a string lace collar on their home and road sweaters will replace the V-shaped collar. The lettering and numbers of the sweaters will also be single layered again, without an outside trim. The new Maple Leafs sweaters are exclusively available between June 14 and June 19 at Real Sports Apparel - the official team store of the Toronto Maple Leafs. Fans who purchase a new Leafs sweater will have an opportunity to have the new captain sign their sweater Tuesday. Dion Phaneuf will be in the store from 10 a.m. - noon tomorrow on June 15. Located at Maple Leaf Square, Real Sports Apparel is the largest licensed apparel store in Toronto and the official, dedicated team shop of the Toronto Maple Leafs, Toronto Raptors, Toronto FC and the Toronto Marlies. The 9,000 square-foot store offers authentic and exclusive collections from all four teams, as well as a wide range of licensed merchandise from the NHL, NBA, MLS, MLB, NFL, UFC and more. For more information, visit www.realsports.ca.